DIE Martis, 2 die Augusti. Ld. Balmerino and Justice Heath. Captains Slingsby and Wake to be bailed. Letter from Justice Reeve, about Lord Brooke's Indictment. Declaration of Reasons for the Parliament's taking up Arms. Answer to the H. C. with it, and that the Lords are ready to procced against the Lord Mayor. To be proceeded in Tomorrow. Parliament's Declaration of Reasons for taking up Arms. Ordered, That the Cause of the Lord Balmerino and Justice Heath shall be heard on Thursday next; and the Judge, or his Agents, to attend. Ordered, That the Cause against Captain Slyngsby and Captain Wake shall be heard on Monday next; in the mean Time, they may be bailed, with sufficient Sureties. The Lord Viscount Say & Seale reported from the Committee some Alterations in the Declaration of both Houses, declaring the Reasons, why the Parliament takes up Arms of Defence, etc. To deliver to them the Declaration; and to let them know, that this House agrees unto it, with the Amendments and Alterations; also to give them Notice, that their Lordships are ready to proceed against the Lord Mayor. This House received a Bill of Charges from the Gentleman Usher; and the House referred it to the (fn. 1) Perusal of Doctor Aylett and Doctor Heath, who are to examine the Particulars, and report the same to this House To-morrow Morning. That they will send up a Committee, presently, to manage the Evidence concerning the Lord Mayor; and that they do agree with their Lordships in the Amendments and Alterations in the Declaration now sent down. That the Lord Mayor shall be admitted to examine these Two Witnesses, in this Cause, and at this Time. And the Committee of the House of Commons and the Lord Mayor being called in, the Speaker told him the Resolution of the House as abovesaid. And then Sir Jo. Gaire, Alderman, was produced, upon Oath; who said, "He remembers that, about the End of February last, there was a Meeting at the Lord Mayor's House, at the Request of some Commoners, concerning a Petition which Mr. Benyon had made, and the Aldermen were to give their Opinion therein; who, having read it, withdrew themselves, to consider of it; and the Lord Mayor assented to it as much as any of the rest." Sheriff Clarke, upon Oath, spoke to the same Purpose, concerning the Paper that was sent to the Recorder. 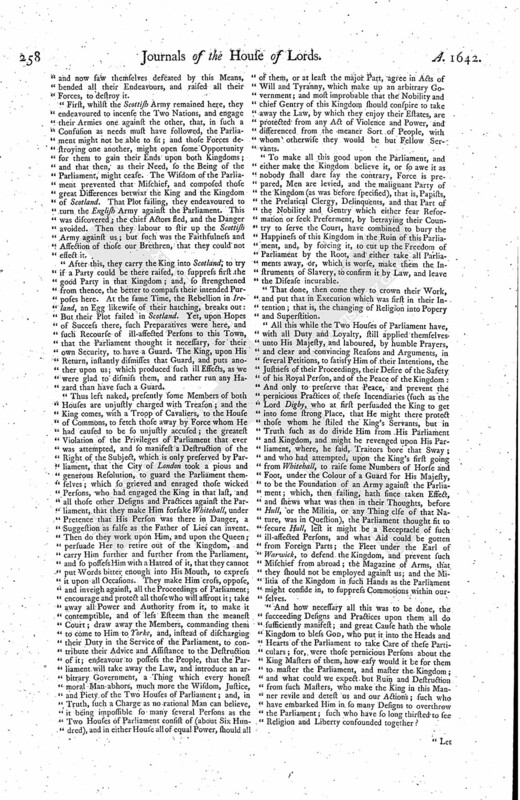 Next, Mr. Herne made the Lord Mayor's Defence to the Fourth Article of the Charge, for not punishing a notorious Riot. He desired "it might be observed the Persons upon whom the Riot was committed;" and said, "That divers Inferences (fn. 2) are given in Evidence, which are not charged in the Entertainment; and his bidding them go to the Committee, and feasting of them." He said, "That a Riot cannot be committed by a single Person. "That the Evidence given by Mr. Dod, etc. is too general, but not a Ground for the Lord Mayor to proceed upon. "There was but One of the Three Men brought before the Lord Mayor, to be bound over concerning the Riot. "That the Lord Mayor ought not to have delivered the Informations out of his Hands, being the King's Evidence. "The Cross in Cheapeside is a Boundary of a great many Inheritances of Houses in Cheapeside. "That People had fastened Ropes, to pull down the Cross, on Candlemas-day; and the Lord Mayor did double the Watch, and caused some of the Trained Bands to prevent the Tumult, and gave out his Warrants to this Purpose." Sheriff Clarke said, "That, on Candlemas-day last, about Four a Clock in the Afternoon, the Lord Mayor sent for him, and he found many People at the Lord Mayor's, examining the Business concerning the Cross; and he sent forth Warrants to Captain West and Captain Manwaring, to come with the Trained Bands, to suppress the Tumult; and he called the other Sheriff, and made Proclamation to command the Tumult to depart. The Prentices demanded their Fellow Prisoners out of Prison, committed by the Lord Mayor; and went to the Compter, and did begin to pull down the House for them; but Captain Foster, with his Trained Bands, prevented it. That from the 11th of January he had Power, by Parliament, to raise the Trained Bands." Henry Wall, a Constable, said, "He found Two fighting before his Door. He commanded the Peace, but the Tumult being so great, the Gentleman escaped; but he brought Bennett to the Lord Mayor, but was released because he could not keep him longer, for his Doors were threatened to be broken open. That he had then in his Hands a Precept for Double Watch." Myles Smith said, "He came with a Javelin in his Hand, and was knocked down Three Times, and the Cooper cut his Javelin in Three Pieces. The Compter Gates were likely to have been broken down, because the Prentices thought that some of their Fellows were committed there." A Recognizance was read, wherein Turrell, Temple, and Waldow, is bound over to the Sessions by the Lord Mayor. "That Bingham and Smith were never brought before the Lord Mayor. "That an Action was brought against Smith, and nothing could be recovered against him, but he was discharged by the Jury." Henry Bingham, upon Oath, said, "He was never brought before the Lord Mayor." Meredith said, "He was of Counsel with Temple, and he was discharged by the Jury." It being now late, they withdrew; and Ordered, That To-morrow Morning, at Nine a Clock, this Business is to be further proceeded in. 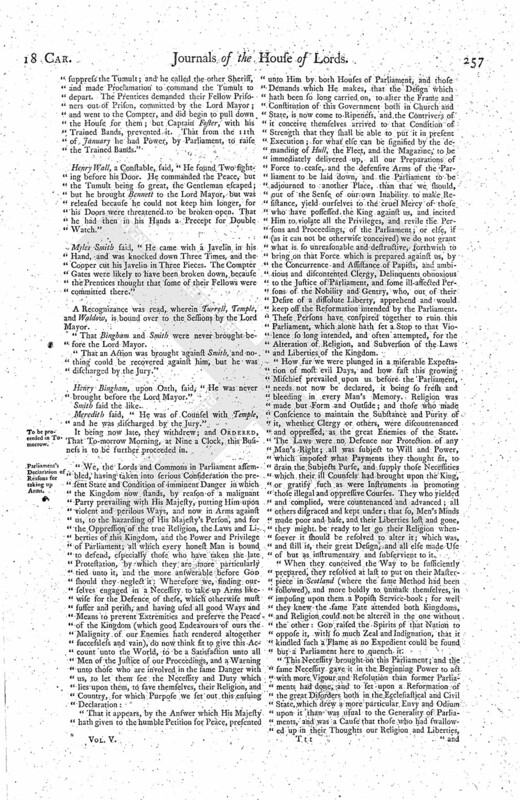 "That it appears, by the Answer which His Majesty hath given to the humble Petition for Peace, presented unto Him by both Houses of Parliament, and those Demands which He makes, that the Design which hath been so long carried on, to alter the Frame and Constitution of this Government both in Church and State, is now come to Ripeness, and the Contrivers of it conceive themselves arrived to that Condition of Strength that they shall be able to put it in present Execution; for what else can be signified by the demanding of Hull, the Fleet, and the Magazine, to be immediately delivered up, all our Preparations of Force to cease, and the defensive Arms of the Parliament to be laid down, and the Parliament to be adjourned to another Place, than that we should, out of the Sense of our own Inability to make Resistance, yield ourselves to the cruel Mercy of those who have possessed the King against us, and incited Him to violate all the Privileges, and revile the Persons and Proceedings, of the Parliament; or else, if (as it can not be otherwise conceived) we do not grant what is so unreasonable and destructive, forthwith to bring on that Force which is prepared against us, by the Concurrence and Assistance of Papists, and ambitious and discontented Clergy, Delinquents obnoxious to the Justice of Parliament, and some ill-affected Persons of the Nobility and Gentry, who, out of their Desire of a dissolute Liberty, apprehend and would keep off the Reformation intended by the Parliament. These persons have conspired together to ruin this Parliament, which alone hath set a Stop to that Violence so long intended, and often attempted, for the Alteration of Religion, and Subversion of the Laws and Liberties of the Kingdom. "How far we were plunged in a miserable Expectation of most evil Days, and how fast this growing Mischief prevailed upon us before the Parliament, needs not now be declared, it being so fresh and bleeding in every Man's Memory. Religion was made but Form and Outside; and those who made Conscience to maintain the Substance and Purity of it, whether Clergy or others, were discountenanced and oppressed, as the great Enemies of the State. The Laws were no Defence nor Protection of any Man's Right; all was subject to Will and Power, which imposed what Payments they thought fit, to drain the Subjects Purse, and supply those Necessities which their ill Counsels had brought upon the King, or gratify such as were Instruments in promoting those illegal and oppressive Courses. They who yielded and complied, were countenanced and advanced; all others disgraced and kept under; that so, Men's Minds made poor and base, and their Liberties lost and gone, they might be ready to let go their Religion whensoever it should be resolved to alter it; which was, and still is, their great Design, and all else made Use of but as instrumentary and subservient to it. "When they conceived the Way to be sufficiently prepared, they resolved at last to put on their Masterpiece in Scotland (where the same Method had been followed), and more boldly to unmask themselves, in imposing upon them a Popish Service-book; for well they knew the same Fate attended both Kingdoms, and Religion could not be altered in the one without the other: God raised the Spirits of that Nation to oppose it, with so much Zeal and Indignation, that it kindled such a Flame as no Expedient could be found but a Parliament here to quench it. "This Necessity brought on this Parliament; and the same Necessity gave it in the Beginning Power to act with more Vigour and Resolution than former Parliaments had done, and to set upon a Reformation of the great Disorders both in the Ecclesiastical and Civil State, which drew a more particular Envy and Odium upon it than was usual to the Generality of Parliaments, and was a Cause that those who had swallowed up in their Thoughts our Religion and Liberties, and now saw themselves defeated by this Means, bended all their Endeavours, and raised all their Forces, to destroy it. "First, whilst the Scottish Army remained here, they endeavoured to incense the Two Nations, and engage their Armies one against the other, that, in such a Confusion as needs must have followed, the Parliament might not be able to sit; and those Forces destroying one another, might open some Opportunity for them to gain their Ends upon both Kingdoms; and that then, as their Need, so the Being of the Parliament, might cease. The Wisdom of the Parliament prevented that Mischief, and composed those great Differences betwixt the King and the Kingdom of Scotland. That Plot failing, they endeavoured to turn the English Army against the Parliament. This was discovered; the chief Actors fled, and the Danger avoided. Then they labour to stir up the Scottish Army against us; but such was the Faithfulness and Affection of those our Brethren, that they could not effect it. "After this, they carry the King into Scotland; to try if a Party could be there raised, to suppress first the good Party in that Kingdom; and, so strengthened from thence, the better to compass their intended Purposes here. At the same Time, the Rebellion in Ireland, an Egg likewise of their hatching, breaks out: But their Plot failed in Scotland. Yet, upon Hopes of Success there, such Preparatives were here, and such Recourse of ill-affected Persons to this Town, that the Parliament thought it necessary, for their own Security, to have a Guard. The King, upon His Return, instantly dismisses that Guard, and puts another upon us; which produced such ill Effects, as we were glad to dismiss them, and rather run any Hazard than have such a Guard. "Thus left naked, presently some Members of both Houses are unjustly charged with Treason; and the King comes, with a Troop of Cavaliers, to the House of Commons, to fetch those away by Force whom He had caused to be so unjustly accused; the greatest Violation of the Privileges of Parliament that ever was attempted, and so manifest a Destruction of the Right of the Subject, which is only preserved by Parliament, that the City of London took a pious and generous Resolution, to guard the Parliament themselves; which so grieved and enraged those wicked Persons, who had engaged the King in that last, and all those other Designs and Practices against the Parliament, that they make Him forsake Whitehall, under Pretence that His Person was there in Danger, a Suggestion as false as the Father of Lies can invent. Then do they work upon Him, and upon the Queen; persuade Her to retire out of the Kingdom, and carry Him further and further from the Parliament, and so possess Him with a Hatred of it, that they cannot put Words bitter enough into His Mouth, to express it upon all Occasions. They make Him cross, oppose, and inveigh against, all the Proceedings of Parliament; encourage and protect all those who will affront it; take away all Power and Authority from it, to make it contemptible, and of less Esteem than the meanest Court; draw away the Members, commanding them to come to Him to Yorke, and, instead of discharging their Duty in the Service of the Parliament, to contribute their Advice and Assistance to the Destruction of it; endeavour to possess the People, that the Parliament will take away the Law, and introduce an arbitrary Government, a Thing which every honest moral Man abhors, much more the Wisdom, Justice, and Piety of the Two Houses of Parliament; and, in Truth, such a Charge as no rational Man can believe, it being impossible so many several Persons as the Two Houses of Parliament consist of (about Six Hundred), and in either House all of equal Power, should all of them, or at least the major Part, agree in Acts of Will and Tyranny, which make up an arbitrary Government; and most improbable that the Nobility and chief Gentry of this Kingdom should conspire to take away the Law, by which they enjoy their Estates, are protected from any Act of Violence and Power, and differenced from the meaner Sort of People, with whom otherwise they would be but Fellow Servants. "To make all this good upon the Parliament, and either make the Kingdom believe it, or so awe it as nobody shall dare say the contrary, Force is prepared, Men are levied, and the malignant Party of the Kingdom (as was before specified), that is, Papists, the Prelatical Clergy, Delinquents, and that Part of the Nobility and Gentry which either fear Reformation or seek Preferment, by betraying their Country to serve the Court, have combined to bury the Happiness of this Kingdom in the Ruin of this Parliament, and, by forcing it, to cut up the Freedom of Parliament by the Root, and either take all Parliaments away, or, which is worse, make them the Instruments of Slavery, to confirm it by Law, and leave the Disease incurable. "That done, then come they to crown their Work, and put that in Execution which was first in their Intention; that is, the changing of Religion into Popery and Superstition. 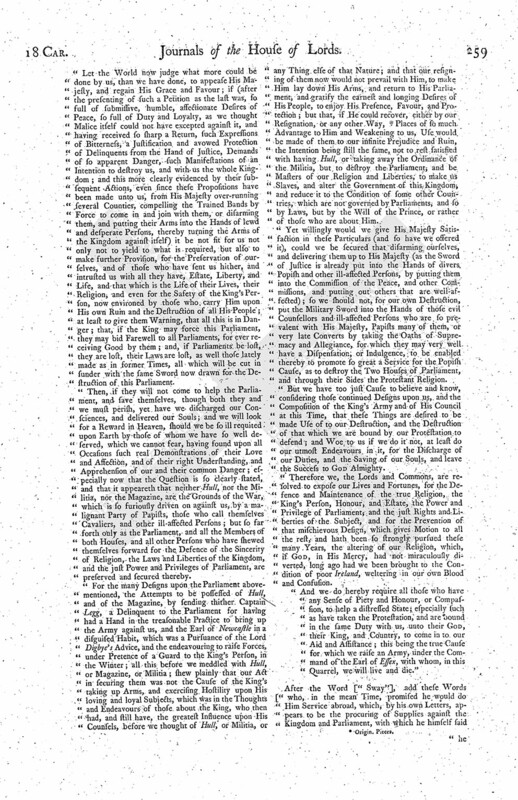 "All this while the Two Houses of Parliament have, with all Duty and Loyalty, still applied themselves unto His Majesty, and laboured, by humble Prayers, and clear and convincing Reasons and Arguments, in several Petitions, to satisfy Him of their Intentions, the Justness of their Proceedings, their Desire of the Safety of his Royal Person, and of the Peace of the Kingdom: And only to preserve that Peace, and prevent the pernicious Practices of these Incendiaries (such as the Lord Digby, who at first persuaded the King to get into some strong Place, that He might there protect those whom he stiled the King's Servants, but in Truth such as do divide Him from His Parliament and Kingdom, and might be revenged upon His Parliament, where, he said, Traitors bore that Sway; and who had attempted, upon the King's first going from Whitehall, to raise some Numbers of Horse and Foot, under the Colour of a Guard for His Majesty, to be the Foundation of an Army against the Parliament; which, then failing, hath since taken Effect, and shews what was then in their Thoughts, before Hull, or the Militia, or any Thing else of that Nature, was in Question), the Parliament thought fit to secure Hull, lest it might be a Receptacle of such ill-affected Persons, and what Aid could be gotten from Foreign Parts; the Fleet under the Earl of Warwick, to defend the Kingdom, and prevent such Mischief from abroad; the Magazine of Arms, that they should not be employed against us; and the Militia of the Kingdom in such Hands as the Parliament might confide in, to suppress Commotions within ourselves. "And how necessary all this was to be done, the succeeding Designs and Practices upon them all do sufficiently manifest; and great Cause hath the whole Kingdom to bless God, who put it into the Heads and Hearts of the Parliament to take Care of these Particulars; for, were those pernicious Persons about the King Masters of them, how easy would it be for them to master the Parliament, and master the Kingdom; and what could we expect but Ruin and Destruction from such Masters, who make the King in this Manner revile and detest us and our Actions; such who have embarked Him in so many Designs to overthrow the Parliament; such who have so long thirsted to see Religion and Liberty confounded together? "Let the World now judge what more could be done by us, than we have done, to appease His Majesty, and regain His Grace and Favour; if (after the presenting of such a Petition as the last was, so full of submissive, humble, affectionate Desires of Peace, so full of Duty and Loyalty, as we thought Malice itself could not have excepted against it, and having received so sharp a Return, such Expressions of Bitterness, a Justification and avowed Protection of Delinquents from the Hand of Justice, Demands of so apparent Danger, such Manifestations of an Intention to destroy us, and with us the whole Kingdom; and this more clearly evidenced by their subsequent Actions, even since these Propositions have been made unto us, from His Majesty over-running several Counties, compelling the Trained Bands by Force to come in and join with them, or disarming them, and putting their Arms into the Hands of lewd and desperate Persons, thereby turning the Arms of the Kingdom against itself) it be not fit for us not only not to yield to what is required, but also to make further Provision, for the Preservation of ourselves, and of those who have sent us hither, and intrusted us with all they have, Estate, Liberty, and Life, and that which is the Life of their Lives, their Religion, and even for the Safety of the King's Person, now environed by those who carry Him upon His own Ruin and the Destruction of all His People; at least to give them Warning, that all this is in Danger; that, if the King may force this Parliament, they may bid Farewell to all Parliaments, for ever receiving Good by them; and, if Parliaments be lost, they are lost, their Laws are lost, as well those lately made as in former Times, all which will be cut in sunder with the same Sword now drawn for the Destruction of this Parliament. "Then, if they will not come to help the Parliament, and save themselves, though both they and we must perish, yet have we discharged our Consciences, and delivered our Souls; and we will look for a Reward in Heaven, should we be so ill requited upon Earth by those of whom we have so well deserved, which we cannot fear, having found upon all Occasions such real Demonstrations of their Love and Affection, and of their right Understanding, and Apprehension of our and their common Danger; especially now that the Question is so clearly stated, and that it appeareth that neither Hull, nor the Militia, nor the Magazine, are the Grounds of the War, which is so furiously driven on against us, by a malignant Party of Papists, those who call themselves Cavaliers, and other ill-affected Persons; but so far forth only as the Parliament, and all the Members of both Houses, and all other Persons who have shewed themselves forward for the Defence of the Sincerity of Religion, the Laws and Liberties of the Kingdom, and the just Power and Privileges of Parliament, are preserved and secured thereby. 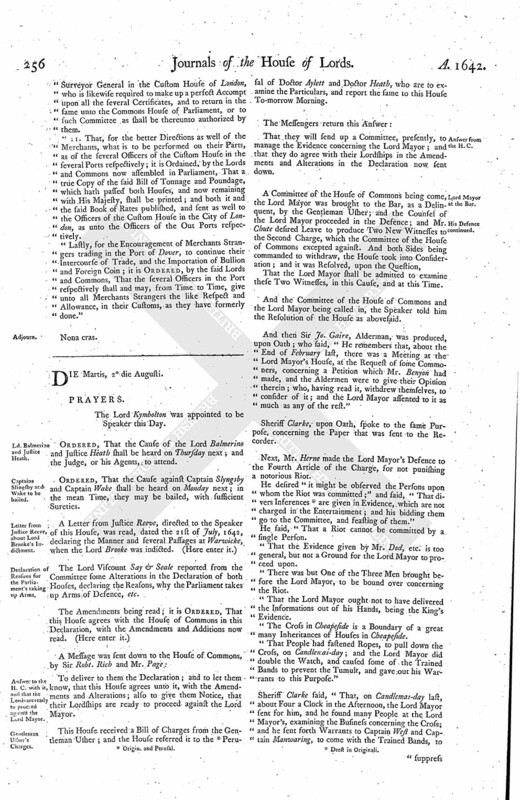 "For the many Designs upon the Parliament abovementioned, the Attempts to be possessed of Hull, and of the Magazine, by sending thither Captain Legg, a Delinquent to the Parliament for having had a Hand in the treasonable Practice to bring up the Army against us, and the Earl of Newcastle in a disguised Habit, which was a Pursuance of the Lord Digbye's Advice, and the endeavouring to raise Forces, under Pretence of a Guard to the King's Person, in the Winter; all this before we meddled with Hull, or Magazine, or Militia; shew plainly that our Act in securing them was not the Cause of the King's taking up Arms, and exercising Hostility upon His loving and loyal Subjects, which was in the Thoughts and Endeavours of those about the King, who then had, and still have, the greatest Influence upon His Counsels, before we thought of Hull, or Militia, or any Thing else of that Nature; and that our resigning of them now would not prevail with Him, to make Him lay down His Arms, and return to His Parliament, and gratify the earnest and longing Desires of His People, to enjoy His Presence, Favour, and Protection; but that, if He could recover, either by our Resignation, or any other Way, (fn. 3) Places of so much Advantage to Him and Weakening to us, Use would be made of them to our infinite Prejudice and Ruin, the Intention being still the same, not to rest satisfied with having Hull, or taking away the Ordinance of the Militia, but to destroy the Parliament, and be Masters of our Religion and Liberties, to make us Slaves, and alter the Government of this Kingdom, and reduce it to the Condition of some other Countries, which are not governed by Parliaments, and so by Laws, but by the Will of the Prince, or rather of those who are about Him. "Yet willingly would we give His Majesty Satisfaction in these Particulars (and so have we offered it), could we be secured that disarming ourselves, and delivering them up to His Majesty (as the Sword of Justice is already put into the Hands of divers Popish and other ill-affected Persons, by putting them into the Commission of the Peace, and other Commissions, and putting out others that are well-affected); so we should not, for our own Destruction, put the Military Sword into the Hands of those evil Counsellors and ill-affected Persons who are so prevalent with His Majesty, Papists many of them, or very late Converts by taking the Oaths of Supremacy and Allegiance, for which they may very well have a Dispensation, or Indulgence, to be enabled thereby to promote so great a Service for the Popish Cause, as to destroy the Two Houses of Parliament, and through their Sides the Protestant Religion. "But we have too just Cause to believe and know, considering those continued Designs upon us, and the Composition of the King's Army and of His Council at this Time, that these Things are desired to be made Use of to our Destruction, and the Destruction of that which we are bound by our Protestation to defend; and Woe to us if we do it not, at least do our utmost Endeavours in it, for the Discharge of our Duties, and the Saving of our Souls, and leave the Success to God Almighty. 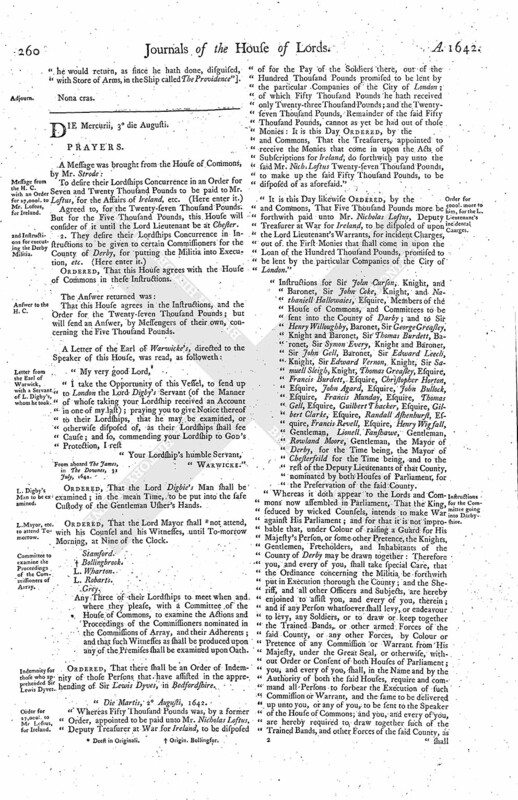 "Therefore we, the Lords and Commons, are resolved to expose our Lives and Fortunes, for the Defence and Maintenance of the true Religion, the King's Person, Honour, and Estate, the Power and Privilege of Parliament, and the just Rights and Liberties of the Subject, and for the Prevention of that mischievous Design, which gives Motion to all the rest, and hath been so strongly pursued these many Years, the altering of our Religion, which, if God, in His Mercy, had not miraculously diverted, long ago had we been brought to the Condition of poor Ireland, weltering in our own Blood and Confusion. "And we do hereby require all those who have any Sense of Piety and Honour, or Compassion, to help a distressed State; especially such as have taken the Protestation, and are bound in the same Duty with us, unto their God, their King, and Country, to come in to our Aid and Assistance; this being the true Cause for which we raise an Army, under the Command of the Earl of Essex, with whom, in this Quarrel, we will live and die." After the Word ["Sway"], add these Words ["who, in the mean Time, promised he would do Him Service abroad, which, by his own Letters, appears to be the procuring of Supplies against the Kingdom and Parliament, with which he himself said he would return, as since he hath done, disguised, with Store of Arms, in the Ship called The Providence"].